Scientists agree that the Lower Mainland is highly vulnerable to flood risk and that there is a 30% chance that a major sized flood will occur sometime in the next 50 years. 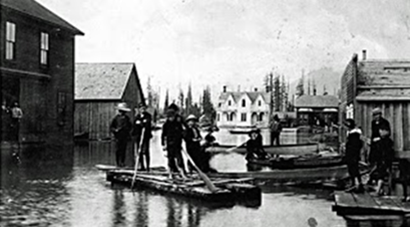 In the past, the Lower Mainland, had two major floods. Many old timers will talk about "The Flood of 1948" but before this there was a much bigger flood in 1894. 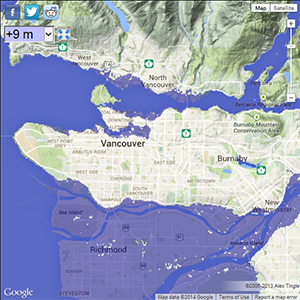 How Will Rising Sea Levels Affect Your Property? Climate change science predicts the ocean that surrounds our communities will rise in Metro Vancouver that could put your housing investment, business and transportation at risk. All of the mapping material presented on this website is provided for visitor interest and information only. FloodPlain.ca can not guarantee the accuracy of what lands will or will not be subject to any flooding activity. Since the material on FloodPlain.ca can not be used accurately it is recommended that all visitors use an alternative data source when making any investment decisions based on the information on this website. For land investments, more accurate data and additional site-specific confirmation via survey is recommended.